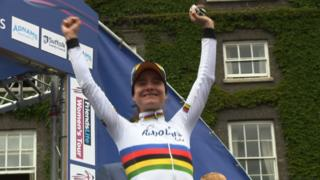 Dutch rider Marianne Vos tells BBC Sport's Nick Hope her victory in the inaugural women's Tour of Britain in Bury St Edmunds was a "special" moment for her and the sport. It was a third successive stage win for the 26-year-old Olympic and world road-race champion, who outsprinted Giorgia Bronzini to take the stage, with Amy Pieters third and Britain's Hannah Barnes in fourth. Two-time world junior champion Lucy Garner ended the race as the best-placed Briton, in seventh overall, with compatriot Sharon Laws winning the 'Queen of the Mountains' jersey.